is so good approximate is great. 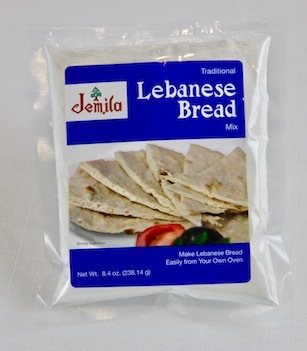 Mix the Jemila Lebanese Bread Mix and water in the mixing bowl until smooth and well developed. Let rest 30 minutes in a warm place (under an under counter light is my favorite place) to relax dough. Lightly coat the bottom of the pan with 1⁄2 of the olive oil. Spread the dough into the pan to the edges by hand or rolling pin. Oil the top of dough and flip over in the pan. Make sure what is now the top is covered completely with a light coating of Olive Oil. Dimple the top with your finger tips every few inches. Sprinkle to taste with salt, pepper and garlic powder. Add anchovies to taste. Let rise at least 2 hours in a warm place. Preheat oven to 350 degrees and bake the pizza shell on a middle rack for 15-18 minutes until the dough begins to sizzle in the olive oil and the dough begins to brown.